How To Celebrate All Hallow's Eve – Read Your Halloween Horoscope! Halloween Astrology 2018 – Seriously Spooky! This Halloween (October 31st 2018) falls on a Wednesday, and at 3.25 am (London time, 10.42 am Hong Kong time / Oct 30 10.42 pm EST) the moon moves into Leo! Mercury in Scorpio 29º / Mercury in Sagittarius 0º (from 12.38 pm Hong Kong time / 12.38 am EST). There’s a lot to say about this Halloween in particular. We have a T-Square in the fixed signs (Taurus, Leo and Scorpio) at 0º, involving Venus–retrograde–in Scorpio, Uranus in Taurus across the way (also retrograde) and as Halloween begins the moon (in Leo) will align with the North Node of fate at 0º. So Venus and Uranus are in perfect opposition to each other, and the moon’s nodal axis forms a square too! This spells major tension in the skies on All Hallows Eve, as these three zodiac signs in the fixed modality are held in tension. the Moon wants to flicker warmly, burning bright in Leo – the mood is dramatic and willing to be seen (moon in Leo). There’s also a significant trine in water between Jupiter and Chiron, offering a degree of healing, loosely supported by Saturn and Pluto in earthy Capricorn. 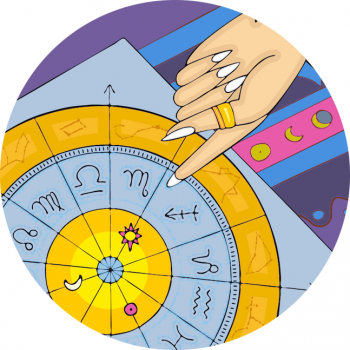 The fixed signs have one thing in common – they err on the side of immovability – they’re hard to budge. And yet with this energy it’ll be a compelling time of shake-ups, shocks (Uranus) and looking deeper (Scorpio), beyond the looking glass (Jupiter aligned with Chiron in Pisces) – still dazzled by what’s loud and glamorous (Leo). We’ve had the north point of the nodal axis in Leo since May 2017 and its getting ready to change signs into Cancer. Interestingly Trump (29º Leo rising) came into his reign Jan 2017, so has been in the spotlight with the north node in Leo all this time. Time to de-throne the King..? With the moon in Leo – and your playful zone of amorous love – you could be in the mood to party this Halloween, Aries! However there’s a contender to your fun – i.e. your lover, boss or friend, or even your position in the world, which forces you to dig a little deeper and show a more serious side. Scorpio season has you tuned-in to private affairs, as planets stack up in your zone of close bonds and commitments. Trust, loyalty, and your intimate needs are highlighted – let partners lead the way over Halloween… Dress for a good time but be mindful not to totally steal the show. Venus (retrograde) in Scorpio comes into conflict with the showy moon, and with sparky Uranus thrown in the mix there could be fireworks. If you go to a social gathering you might find yourself in a tête-à-tête with the most magnetic force in the room, drawn into private discussions and sharing secrets. Play, but play it safe, Ramzilla! Partners and important unions are spotlighted this Halloween, Taurus, as your relationship zone is chock full of planets – including your ruler, Venus! What’s more, the moon has switched into low gear, headed in to your home arena, ready to feel nourished and safe in the bosom of family. Believe it or not these are two areas of life that compete with each other, and you could find one person in particular is demanding today! Also, since mid-May your sign has been host to Uranus, a planet of unrest that promises to shake up your personal life and purpose. This planet of surprises is triggered on Halloween, so although the mood of the moon is encouraging you to nest and go within, you might find you’re restless and looking to experience more! Promising adventures are offered in a duo, and being with another can ultimately broaden your horizons, so team up with a special friend or lover, while maintaining your ties to home. Halloween is a busy time for the Twins, as Scorpio season illuminates your productive zone of habits, work and healthy rituals. You could be feeling pre-occupied with your job or the tasks yet to accomplish, which have no doubt been on the increase this year. However the mood of the Leo moon enhances your connection to others, and thus you could be feeling wildly sociable. Make time for treats though you’ve lots to do; don’t let the fun go unnoticed! Your ruling planet Mercury slips into the relationship area of your horoscope now, so begin to look towards others for answers – with close kindred spirits emphasised talk to your inner circle! Scorpio season is your time to be creative and have fun, Cancer! Think of the things you LOVE: special hobbies (including sports and exercise), dating and sexual liaisons, a new baby, blog or website! Crabs could be truly embroiled with these special projects now, which are (in theory) enjoyable experiences. For example, Cancer Rising Meghan Markle has just announced her first pregnancy, while Cancerian Ariana Grande has the spotlight on her love life. The focus is particularly enhanced because of Jupiter, who has been blooming in this area of your horoscope All Year. What’s more, Venus is retrograde in this playful, romantic zone, bringing even more weight to personal interests. The mood of the moon is for you, erring on the practicalities, as Luna enters Leo and your money-minded zone of income today. This creates tension between your role and your passions. Uranus is also creating a splash of tension too, potentially in your wider circle or friendship group. So, enjoy yourself but take it easy crab cake! The moon moves into your sign today, Leo, allowing you to feel good about yourself and efforts to make the world revolve a little more around you. With this years eclipses in your sign, there’s been a steady focus on Lions, and although partnerships have been exciting over Autumn-time you can really embrace your independent side. Home life is in focus for Halloween, as the Scorpio sign directs your attention inward, towards emotional anchoring and your domestic roots. Where you live–or your connection to your ancestral past–has been gleaning attention this year. However, on the 31st there’s tension between the moon in your sign (focusing on you), Venus in your zone of home (realigning your values), and Uranus reinventing the impression you make in public. Despite the volatility in the stars it’s possible to throw an epic party – just allow your guests free reign (and put away the valuables). Your inner circle, co-workers or besties are spotlighted during Halloween, Virgo Maiden, with your zone of sibling connections in focus. However it’s also a time to retreat, with the moon in the dreamy area of sleep, closure and release – that means take it extra easy! While it’s a compelling time to mix, mingle, trick or treat, you might be better to step out some other time. Close friendships could feel a little off, with Venus backspinning in this sociable zone. And, while in some ways it’s a productive time, on the other side of the coin you’re being tasked with putting into practice all you’ve learnt over summer about surrender and rest. You’re in a strong position to reassess and review your role, Libra, a role that’s flourished this year. And not only your role but your income, finances, the way you earn and make money, the way you feel good about yourself, the way you put your best foot forward, practically and productively. Halloween feels sociable, with the moon in your zone of the collective, and there maybe a company or community gathering you’re drawn to. It’s also a jarring day, as Uranus presents tension in your intimate zone of close bonds. Perhaps you’ll be surprised by developments around spending or investments, or suddenly change your mind about who or what you have time and resources for. With a fairly volatile mood in play take it easy, coming together with warmth and camaraderie. Scorpio season is your time to shine, however Venus retrograde in your most personal domain might have thrown you a curveball, Scorpio. You might presently be undergoing a review of your approach to life – including your position and career path, your domestic and home setting, and also turning your thoughts to finances. However Halloween is one moment to press pause, and soak up a little of the limelight. With the moon in Leo – and your worldly direction – you could now be getting recognition for your accomplishments, or choices made. This might not sit perfectly with yourself – or others for that matter, nevertheless claim your moment as you wish. All Hallows Eve is a night when the veil draws thin, when the spooks go out, but you can go within, Sagittarius. Scorpio represents the area of your horoscope governing closure, and managing from behind the scenes – and this year it’s been a major theme for you. You may have hunkered down with projects to see through – championing others or simply waiting to launch something special, yourself. With Venus in moonwalking through your zone of dreams and surrender, it’s even more compelling to allow your intuition to kick in – particularly around relationships, your finances and role. The Leo moon lights up your connections to those far away, and you could be feeling adventurous – despite the need for solitude. Allow a warm flicker to inspire you, but avoid fireworks. Friendships may have been a little off lately, with Venus taking its retrograde turn in the sociable area of networking and your wider circle, Capricorn. However your focus is firmly fixed on these relationships, with the sun, Jupiter, Mercury and Venus in the vicinity. The moon moves from your inter-personal zone of one-to-ones to the committed area of your horoscope, and with this tension builds. Halloween could feel highly strung if you’re among your community; Uranus has also entered your passionate zone of creative impulses, which adds fuel to the fire! In the years ahead your approach to parenting or creative ventures could be turned on its head. But for Halloween, wind down and maintain composure, as much as possible. Remember, you’re the zodiac’s responsible sign, stay classy. This year has spotlighted your public face, Aquarius, and you may have recently been tweaking and refining the image the world sees. You might have even bought some new clothes – for your position at large, or improved your profile online. Halloween continues to illuminate your path, however it also puts the emphasis on special partnerships that have proven key over the summer. With the moon in Leo – and your zone of productive, busy agendas and work life – you could be feeling keen to perform this Halloween, Pisces. However with Scorpio season (and expansion planet Jupiter in your adventurous zone of growth) the stars are emphasizing broader horizons, and guiding your outlook further towards big projects, plans or philosophies. This year you may have really embraced education, or perhaps you’ve learnt some invaluable lessons. Perhaps you’ve travelled or have taken a journey or quest in another guise. Pisces Rihanna launched Fenty Beauty just as Jupiter was entering Scorpio last year, and has had a year learning about the beauty industry (with great results!) Not to mention she was named Harvard University’s Humanitarian of the Year. Today, the need to tend to your daily tasks and habitual practices clashes with this world full of potential. On November 1st Venus dips back into Libra!